I read this article and found it very interesting, thought it might be something for you. The article is called Currency In Circulation 91% Of Pre-Demonetisation Value; Digital Payments Up But Fluctuating and is located at https://archive.indiaspend.com/cover-story/currency-in-circulation-91-of-pre-demonetisation-value-digital-payments-up-but-fluctuating-58939. One year after the government annulled high-denomination currency notes and subsequently replaced them with new notes, the total currency in circulation remains 9% less in value terms. Digital payments have increased in number and value, but fluctuate month to month. 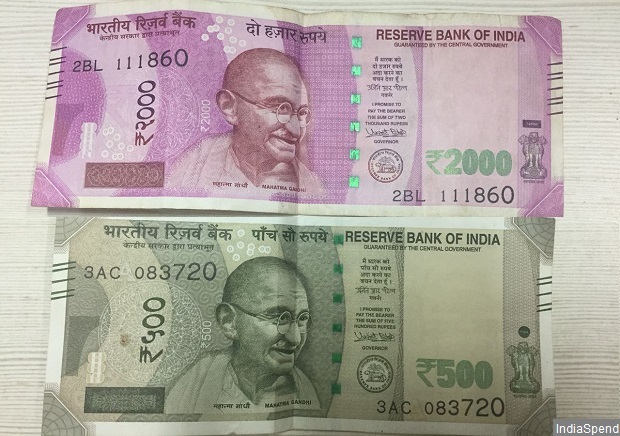 On November 8, 2016, Prime Minister Narendra Modi had announced a surprise withdrawal of Rs 500 and Rs 1,000 notes–which constituted 86% of cash in circulation at the time–a move he said would help weed out corruption, curb money laundering, and remove black money and counterfeit notes from the system. Soon after announcing the move, the Prime Minister had proceeded on a trip to Japan, inviting much censure. By the time he had returned on November 12 to face widespread demands for an explanation, the government’s spin doctors had affixed the terms “demonetisation” and “notebandi” to the move, claiming a shifting array of motives, as IndiaSpend reported on December 5, 2016, after analysing the Prime Minister’s speeches (in translation). A year on, currency notes totaling Rs 16.35 lakh crore in value are in circulation (as on October 27, 2017), comprising 91% of the Rs 17.97 lakh crore on November 4, 2016, before demonetisation, according to data released by the Reserve Bank of India (RBI) on November 3, 2017. Digital payments increased in value to Rs 124.7 lakh crore in September 2017, up 33% from Rs 94 lakh crore in November 2016, but dipped by 20% by October 29, 2017 to Rs 99.3 lakh crore over the preceding month, RBI data on electronic payments system, updated on October 31, 2017, show. Month-wise data indicate similar fluctuations. The high-denomination notes that were annulled amounted to Rs 15.44 lakh crore, about 99% (Rs. 15.28 lakh crore) of which had been returned to the central bank by June 30, 2017, according to the RBI’s annual report 2016-17, IndiaSpend reported on September 5, 2017. The currency in circulation has steadily increased since January 2017. It cost the RBI Rs 7,965 crore to print new currency notes between July 2016 and June 2017, as against Rs 3,420 crore in 2015-16, an increase of 133%, IndiaSpend reported on September 5, 2017. “The share of small currency notes was 54% in 2004, declined to 28% in 2009 and was 13% when demonetisation happened. It has now gone back to 28%, the 2009 level,” said Soumya Kanti Ghosh, group chief economic advisor, ‎State Bank of India. A larger share of small currency notes leads to less corruption and a cleaner economy, he said, adding that the RBI has consciously reduced the printing of currency notes to push digital payments. The number and value of digital payments has increased compared with the pre-demonetisation level, but by varying extents each month. Although there is a 6% increase in the value of digital payments recorded in October 2017 (Rs 99.3 lakh crore) over November 2016 (Rs 94 lakh crore), there is much monthly variation. Source: Reserve Bank of India/National Payments Corporation of India; Data updated as on October 31, 2017. Figures upto October 29, 2017. Note: Data are provisional. Card transactions of four banks are covered; prepaid payment instruments issued by eight issuers for goods and services transactions only are included; mobile banking figures are from five banks; the total volume & value of electronic payment systems does not include mobile banking; figures from the national automated clearing house are for approved transactions only; Digital payments include Real time gross settlement, National electronic funds transfer, Cheque truncation system, Immediate payment service, National automated clearing house, Unified Payments Interface, Debit and Credit Cards at point of sale and Prepaid payment instrument. Digital payments increased in value by 11% in the month immediately after demonetisation–from Rs 94 lakh crore in November 2016 to Rs 104 lakh crore in December 2016. Yet, they declined by 7% in January 2017 and 11% in February 2017 over December 2016, surged 62% (Rs 149.5 lakh crore) in March 2017 over February 2017, and declined 27% in April 2017 over the preceding month. In terms of number, digital transactions increased 29% to 863.9 million in October 2017, up from 671.5 million at the end of November 2016. “Digital payments lead to clean economy as it tracks money transactions, eliminates tax evasion and other social costs of currency,” Ghosh said. The currency in circulation before demonetisation was 12% of the GDP, and is now below 10% of GDP, he said. PPI value has more than doubled from Rs 1,320.7 crore in November 2016 to Rs 3,061.8 crore in October 2017. Payments using debit and credit cards at POS, for which data from four major banks are available, are up 35% from Rs 35,236 crore in November 2016 to Rs 47,530 crore in October 2017. Post-demonetisation, about 57% of credit card holders said they were using credit cards more often than they did a year ago, according to a survey by TransUnion Cibil, a credit information firm, The Indian Express reported on November 1, 2017. Payments using UPI have registered by far the greatest increase of 6,981% (70-fold) in value, from Rs 90.5 crore in November 2016 to Rs 6,409.9 crore in October 2017. Based on the UPI platform, the government launched the Bharat Interface for Money, commonly known as the BHIM App, in December 2016, a month after demonetisation. Transactions through this app have increased in volume almost 179-fold (17,767%), from 42,716 in December 2016 to 7,632,348 in October 2017. The reasons for its success include the fact that BHIM can be used on any phone–and not just a smartphone–and does not require an internet connection, a limitation in vast parts of the country. The latest data from NPCI indicate a 120% increase in the use of UPI transactions in just one month from September 2017 (30.8 million transactions) to October 29, 2017 (67.8 million). In a tweet NPCI cited an even higher figure for all of October 2017, 76.96 million. In value terms, however, UPI payments accounted for less than 1% (or 0.1%) of the total electronic payments (Rs 99.3 lakh crore) made in India for the month October 2017, even though in absolute numbers (67.8 million) it accounts for 7.8% of total electronic transactions (863.9 million). By value, RTGS accounts for 80% of the total electronic payments made in October 2017, NEFT 12%, CTS 5.7%, IMPS 0.7% and NACH 0.8%. “RTGS and NEFT are high-value transactions over the internet; corporates and banks are its big users. UPI is used more at the retail level, and transaction values are typically lower,” Madan Sabnavis, chief economist at CARE Ratings, told IndiaSpend. Aadhaar-enabled payments–not added under digital payments in the above calculations–have more than doubled (169%) from 37.8 million transactions in November 2016 to 101.9 million in June 2017. Meanwhile, payments through mobile banking, for which figures from five banks are available, have also fluctuated month to month, although they shrank in value by almost 15% to Rs 1,05,352 crore in October 2017, as against Rs 1,24,485 crore in November 2016. Despite the uptick in digital transactions since demonetisation, India reports the lowest digital payment transactions per capita per annum (11), as compared with similarly-placed economies such as China (26), Mexico (32), South Africa (70) and Brazil (142), according to NITI Aayog’s January 2017 report. With the rapid development of digital infrastructure, the number of internet users in the country will double from 300 million in 2015 to 650 million by 2020, according to a July 2016 report entitled Digital Payments 2020 by Google and the Boston Consulting Group. “Modified UPI will be a game changer… Digitisation of cash will accelerate over the next five years with non-cash transactions over-taking cash by 2023,” the report said. However, economists differ in their prognosis. “Digital payments carry a cost and hence will be used in moderation until they [costs] come down,” Madan Sabnavis, chief economist at CARE Ratings, told IndiaSpend. The initial upsurge was due to absence of cash, which has been corrected. While the number and value of digital payments is now higher, only a section of the population has taken to it in a big way. “With cash returning to the system, there has been some reverse migration from digital to cash. We need to incentivize people and not charge them for going digital to really succeed,” he added. A cashless economy requires digital infrastructure such as swipe machines, smartphones and an internet connection, as well as widespread financial education, which are lacking across vast parts of the country, as IndiaSpend’s stories one year after demonetisation have reported.